We’re all aware of security when carrying cash. But spare a thought for those tasked with transporting and guarding large sums of money. It goes without saying that security is a major issue for the ‘Cash in Transit’ (CIT) sector. Thanks to innovations by specialist Cash In Transit equipment manufacturers HDH, in partnership with Magnet Schultz Ltd (MSL), a world leader in the development of special-purpose electromagnetic mechanisms, intelligent lock technology ups the ante – and there’s a range of surprises in store for anyone accessing cash boxes illicitly. With the introduction three years ago of electronics engineer and software expert Nigel Graham, technologies now deployed in cash transit solutions include GPS tracking, remote monitoring and automatic ‘cash degradation’ systems if a case is forced open. But industry change is not always driven by technology: HDH is currently running a programme to replace the inks used for cash degradation with dyes that work with the new ‘wipe clean’ polymer banknotes – £5 notes for now, £10 notes this summer and £20 notes in 2020. Today, CIT businesses come to HDH to get the very latest in transportable security technology to protect their operators, the valuable cargo, and to streamline procedures. Equally as important as degradation systems that deploy automatically on forced entry is ensuring that they don’t activate when a case is opened legitimately. This is typical of a technology application where MSL’s electric lock expertise comes into play, along with additional solutions that include daylight sensors inside the case, surface protection wires inside and out, and reed switches between the lid and the base. All contribute to safety precautions that prevent accidental activation. For first line security, locking is still at the heart of CIT cases. Newton explains that the original electro-permanent magnet used as the HDH case lock met the minimum security requirements but wasn’t the most elegant solution. Instead, the new lock requirement demanded special characteristics, not least of which were light weight for portability, strength for mechanical integrity when locked, small size for installation within the confines of the CIT case and of course miserly power consumption for long battery life. We relished the challenge!” says Newton. An initial meeting with MSL technologists saw the application defined, various options discussed and ideas developed. Certain characteristics were imperative for the very high-end CIT application. The lock had to be certified to 250,000 actuations. It needed switches of the highest quality. And it had to be non-ferrous. The very secure locking system needed to be operable by HDH’s electronics: in this instance a signal generated by a mobile phone with GPS security. 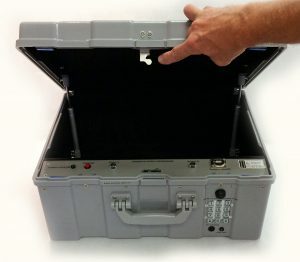 The case lid must pop open when unlocked and seal completely when locked – to prevent daylight setting off the smoke or dye-based degradation system. A lock deactivation feature must allow the lid to be closed without locking. “We still relished the challenge, even when HDH added a requirement to extend the application to several other case designs,” says Newton. With the initial lock specifications agreed, MSL engineers prepared drawings. Once approved by HDH, a custom-designed prototype electric lock mechanism was produced for evaluation using MSL’s rapid prototype 3D print technology. “This rapid prototyping capability significantly cuts the product development cycle,” Newton claims. Changes to the prototype design, to make it suitable for a range of HDH products, were then incorporated and a metal prototype created. This was duly approved by HDH for production, at which point the MSL development team carried out function and life-testing. The clever part, according to Hewitt, is the inclusion of microswitches built in to the electric lock subassembly. These separately detect the lid closure and the solenoid actuation motion that performs the mechanical locking, sending a signal to the system’s motherboard. As a result, software can initiate any number of actions, for instance arming a deterrent or a degradation system. Now HDH is incorporating the electric lock design into its newest product – a CIT case for ATM cassette replenishment: “it’s a real ‘cross-pavement’ application, with all the security risks that entails,” says Hewitt. With this new product, HDH has decided to build the CIT case around the locking system and arming technology. The case features a polycarbonate body, which is as strong as steel but which doesn’t behave like a Faraday cage to impact the GPS tracking signal. Delivery of the first batch of these new ‘intelligently secure’ CIT cases takes place this Spring. “Some will be used to transport precious stones. Spraying gems with degrading dye achieves nothing, so these variants of our new case feature a mobile SIM card that sends an SMS message if the case is forced open,” Hewitt explains. As Michael Hewitt points out, the requirement was for the new electric lock design to be used in many different variants of HDH cases, products and security applications. And that requirement has been met. He’s looking to Magnet Schultz Ltd to supply 250 units.